Pink House, originally uploaded by sea turtle. Much has been said on CHS about the increasing un-affordability of renting on Capitol Hill. But if you’ve been looking to buy a house in the neighborhood in the past five years, you know the apartment game is basically child’s play. Capitol Hill is among the most competitive home buying markets in the city and likely among the least affordable for its own residents. The result is a marketplace where many homes are not being bought by those who have lived in the neighborhood, says Windermere real estate agent George Beasley. Beasley, who focuses on Capitol Hill listings and runs residentialcapitolhill.com, said the nearing 100-year-old Craftsman and Tudor homes hold great appeal to an older, more affluent and, more often than not, new-to-Capitol Hill buyer. A recent report from Trulia showed that Seattle metro wasn’t the toughest place to house hunt — we ranked as the 23rd most un-affordable market in the nation to buy a home for its middle class residents. According to that report, 55% of homes in the Seattle metro area should be within reach for a household earning the median income of $68,5000. An affordable middle class house in Seattle, according to Trulia, would be $338,000 or less. Meanwhile, only 14% of homes in San Francisco were within buying range for the city’s median income earners. Trulia determined a house to be affordable if the monthly 30-year mortgage payment and taxes fell below 31% of the household median income. Looking at sales data for the three zip codes that cover most of Capitol Hill shows an affordability environment that skews toward SF’s. Last week on Redfin, the median home price in (greater) Capitol Hill was around $573,00, which included condos. The average price jumped to $867,000 when the search was limited to just single family homes and townhouses (note: CHS removed one outlier — an undisclosed $8.5 million mansion, if you’re in the market). Real estate blogger Tim Ellis has been running seattlebubble.com since 2005 — it is mandatory reading for anyone interested in housing trends in the Seattle area. Seattlebubble’s commonly used index tracks relative affordability of houses in the Seattle area (our calculation include condos and single family homes). Like any model, the affordability calculator makes several assumptions about interest rates and down payments* but it offers some insight into how “affordable” buying a house is in Capitol Hill — or really, how affordable it isn’t. Affordability in this case will be considered a mortgage that is less than 30% of household income. To analyze housing affordability in Capitol Hill** we used income data from the U.S. Census and sale price listings from the site Redfin.com. Out of the three zip codes that cover Capitol Hill, the area including Pike/Pine and the Central District is the least affordable place to buy a house for its own residents. The median household income for all residents here is $47,405, nearly half of the median income of households in 98112. On that income, the most expensive “affordable” house would be $294,500, meaning only about 30% of homes currently up for sale in the area are within reach for median income earners. The northwestern chunk of the Hill, including Eastlake, turns out to be the most affordable housing market for current residents. Half of the households in this area can “afford” to purchase a $364,000 home (median sale price) in their neighborhood today. Around 44% of homes are “affordable” to median income earners, who take in $55,311. East Capitol Hill is the wealthiest of the three sections of the area by far, with a median household income of $89,504. The houses are the most expensive as well — the median sale price in the area was $687,500. The most expensive house in the “affordable” range for median income earners would be $553,129, meaning about 27% of home currently listed would be within reach for middle income earners. Around 40% of households could afford a $415,000 house — the median sale price currently listed. Despite the fact that some 40% of Capitol Hill residents may be able to afford a house in the neighborhood, doesn’t mean shopping is easy. Beasley said finding “deals” on single family homes is extremely rare. Even through the crash years, foreclosure and short-sales were tough to come by on Capitol Hill. Beasely said that even if homeowners went belly up, banks saw the value in the neighborhoods and weren’t so quick to dump Capitol Hill homes. *Using a 30yr mortgage with a 4.4% interest rate, 20% down payment. ** The U.S. 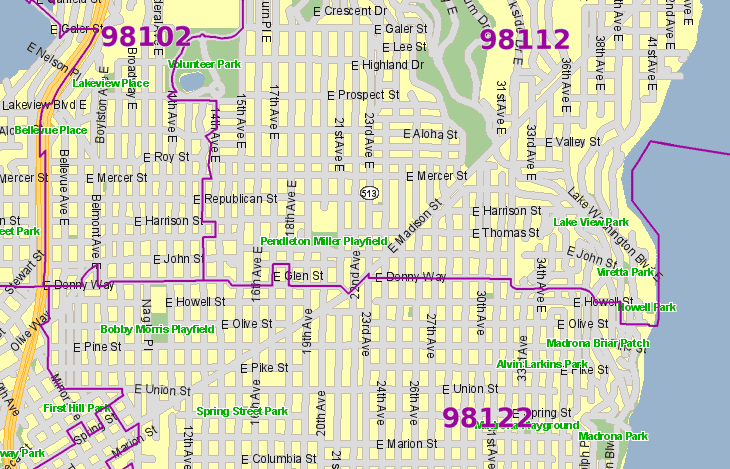 Postal Service wasn’t kind to Capitol Hill when drawing up zip code boundaries, splitting the neighborhood into three zones. Unfortunately, most demographic data is calculated by zip code which makes a proper Capitol Hill analysis difficult. However when delving into the housing market, the larger region is probably a good approximation of where those looking to buy in the “Capitol Hill area” might consider. This entry was posted in News, etc. and tagged real estate by Bryan Cohen. Bookmark the permalink. I’m sorry, but someone making $47,000/yr shouldn’t be owning a house that’s almost $300k that they have to pay for over the next 30 years of their life. If you can’t afford a 15yr mortgage you should stick to renting, until you can afford it – with at least 6 months worth of “emergency funds/living expenses” (incase anything goes wrong)…. And have $0 in debt. This is why you see so many banks in Capitol Hill. They own the city, and the more people we can get into living as close to debt free as possible (not including the house) this will continue. Rent isn’t cheap in Seattle, and a mortgage can cost less over time. What would be your cutoff, anyway? I’ve been looking for a place on the Hill for a while now. Been renting here for over two years. I can’t find places that even make sense financially, and I’m going to gross $100K this year. I imagine I’ll have to move the Central District and gentrify that area personally. I can’t imagine where those poor people will go. Pretty much the standard process for buying a home for the last 30 or 40 yrs or so. I’m on my 4th home and it’s in a great neighborhood. But I’m also 55 yrs old, and I assure you my first home when I was 26 was not. And even 30 yrs ago I couldn’t find a home that fit my budget in the (popular) neighborhood I was renting in. So I really don’t understand the big issue here. This isn’t anything new and it definitely isn’t unique to Seattle. By the way, not sure if you’ve started looking, but you won’t find many cheap homes in the Central District either. Columbia City is heating up for a reason. J, I think 30 year mortgage are pretty standard and can be cheaper than rent and allows people to build up a little equity. I am not sure where your disgust comes from. Also there are some interesting observations, the most expensive and where you say the residents are most likely to be able to own homes, then are often mainly residential single family where the percentage of home ownership is already high and the other areas have a higher percentage of apartment type dwellings or some affordable and low-income housing located within the area. I am not sure what you are trying to say. I am not sure that the gist of the article is very helpful. Once someone want to buy a home they may stay in an area, but not in exactly the same neighborhood, especially if the neighborhood is mainly apartments. A monthly rental payment on a small apartment should be less expensive. All of Seattle has gentrified. 47k a year income and able to buy a 294.5k home? I don’t even know how that’s possible or who would ok that loan? That’s absolutely absurd. I make over 70k a year and my max was 240k when I bought my place. And that would have been stretching it. There are deals to be had, or at least there were. Seems we’re now right back where we were in 2007. But over the last 3 years there’s been some great stuff on the hill and in the CD for substantially less than what it is today. There’s a reason there are so many foreclosed homes and bankruptcies, banks loan way over what people can actually afford. I agree that 180K to 250K is more likely to be the range for someone with a 47K income. However, that changes with the amount that someone can put down. 20% to 25% down will help get a more expensive place. People earning $47k a yr getting qualified for $300k homes is why we had the real estate bust. Plenty of banks lending money on incomes that didn’t prove out. Not anymore. Unfortunately, plenty of cash-rich people were able to swoop in and snap up those foreclosed homes that now turn into rentals. The “rich get richer” story, again. Wow. You really deleted a comment that was a legitimate public health warning about a house that is contaminated with black mold? I guess the real estate agent must be an advertiser. Report it to DPD and the city. Legitimate public health warnings via CHS comments are a rather indirect route. Are there any statistics on single family homes, particularly within 5 blocks of either Broadway and 15th, being sold to individuals who plan to live in them? Right now it seems like any house for sale ends up being bought by developers to be razed…which both drives up the price and drives away potential non-development buyers, because who would want to sink money into a place and then have the rest of the houses on the street come down for craphole apartment buildings? For years I figured I wouldn’t be able to purchase a house in Cap Hill because of the price – and that’s still out of my priceline, for sure, but now I just think there would be no point, since every structure under 4 stories seems to be a target for redevelopment now. Not really actual stats but I can attest personally that there are at least a few of us but you have to be ready for a lot of work if the house is “affordable.” We’re a few blocks west of Broadway – yes, there are still a few houses west of Broadway despite what all the delivery people think – and the previous owner selected our offer because we wanted to live in the house, not tear it down for a-podments. The house behind us went to someone who had to completely redo all the systems to make it livable but he did it because he himself wanted to live in the house, not flip it for a huge profit or as a tear down. Yes, there seems to be somewhat of a “feeding frenzy” going on as far as developers are concerned. A lot of this is being driven by the opening of the light rail station under construction…I live in a small home only about one block from there, and in the past year I have received regular offers from developers/realtors to buy my place for cash. It’s hard to know how many of these offers are actually legitimate, but one of them seemed to be, and it was for about twice what my property is worth!…..giving some idea of how much profit there is in the redevelopment business. But I love my home and am staying put. Over my dead body will it become an apodment! (probably literally). I agree that the pricing of housing around Capitol Hill is ridiculous. It’s not even worth it because they are working to redevelop the entire area, nothing but construction for years to come. Thank you for this additional information. 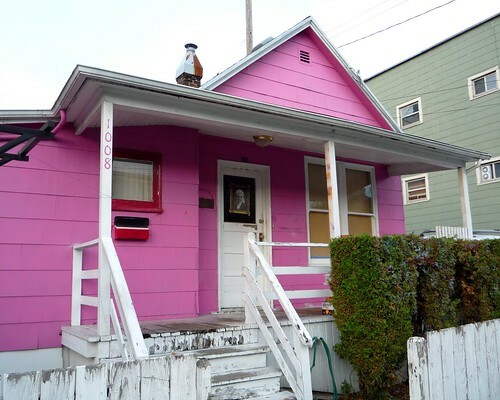 I live on Queen Anne which has a dearth of affordable housing. I will use this information in a letter to the city council regarding the large condo development planned for the Seattle Children’s Home site. I figured that even at 40% of income, not including condo fees, the lowest price condo (of which 66 are planned) would require an income of $105,000 minimum plus down payment of $60-90,000. Plus the development would stress our streets, school capacity, and transit. We do need a city policy assuring rental and owner-occupied homes that the majority of households can afford and to keep options available for our teachers, firefighters, health care workers, and those who make our city livable. According to that report, 55% of homes in the Seattle metro area should be within reach for a household earning the median income of $68,5000. I suspect that’s one too many zeros. Basically, it is supposed to be pre-tax income, but people often low ball those numbers. The spouse and I make well over 100K and are finding Capitol Hill increasingly unaffordable and unlivable. Buying a house here is out of the question when everything west of 15th is going to be redeveloped for apartments in the next 20 years. The only people that seem to be winning are the developers and owners of $$$ restaurants. Another old rule of thumb used to be you could afford 2.5 times your annual income in a house. I assume that presumes a 10 or 20% down payment. That means a $400k house (not even easy to find on CapHill) requires $160k in combined income. Unless you are extremely well paid, it’s just plain unrealistic for younger people or first-time home buyers to expect to afford a house somewhere on Capitol Hill, unless you have a huge down payment. In years past, people just starting out (of somewhat average income) didn’t expect to start right off in the best neighborhood. Not sure why people seem to expect that now. I hate to be the bearer of bad news, but I have to keep it real here: The reason why so many renters on Capitol Hill can’t afford to buy a home there IS BECAUSE THEY ARE RENTINIG ON CAPITOL HILL. I mean, duh! In order to save up cash for a down payment, one must live in an affordable area for quite a while first and save up extra pennies. Living in a high rent, rundown studio in the trendiest area is not the way to being able to afford to buy a house. So please, less complaining and more common sense saving. To become a Capitol Hill homeowner I had to move off the hill. I purchased a 95k condo in Burien, renovated it and a year later sold it taking my profit to put down on a Capitol Hill condo. I was saddened to leave the hill to become a homeowner but knew it was my only option. I hope I never have to sell my current Capitol Hill home. Well said, anon. It would be interesting the know the facts regarding the “average” Capitol Hill resident pays in rent relative to their income…..I suspect it would be far more than the 30% figure which is considered what a reasonably prudent person should pay for housing. I think that the underlying factor in all this is the sense of “entitlement” that many young people seem to have. They rent an expensive apartment in a building they really cannot afford, and try to buy a “starter” home in a neighborhood they cannot afford. Then they complain, here and elsewhere, that housing is “unaffordable.” Whatever happened to the concepts of “savings,” and “living within your means”? Obama was elected thats what. There’s some interesting ideas posted here about what is “reasonable” and affordable… while personally I wouldn’t be comfortable spending 31% of our family’s gross income on mortgage/taxes/PMI that number is however far more aligned with the reality of what is actually affordable for most households.. more so than say what “J” wrote in the 1st thread, or the 2.5x annual income bit.